News and Events - RELIEF AFTER VIOLENT ENCOUNTER - IONIA/MONTCALM, INC.
August 13, 2010 - Ionia - Relief After Violent Encounter-Ionia/Montcalm Inc. (RAVE) is proudly stepping out in the community by disclosing our once private location. 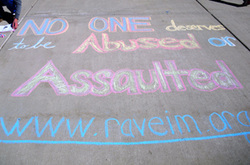 RAVE offers free and confidential services to victims of domestic violence and sexual assault. RAVE is inviting the community to join it for a sign groundbreaking ceremony and barbecue today from 3 to 6 p.m. The Knights of Columbus are generously donating hot dogs, chips and dessert for the community and they will be there in support of RAVE and the services RAVE provide to the community. "Many people in the community know where we are already, so this is just a way of being more visible'" RAVE President Angela Dockett said. "Domestic and sexual violence are issues that need to be discussed, and part of our responsibility to the community is to create awareness for the issues." Information regarding the services offered by RAVE will be available as well as an opportunity to meet and greet some of the staff and board members of the organization. "We trust that the community will keep an eye on our safety and keep us informed of suspicious persons around the shelter," RAVE Executive Director Erin Roberts said. "Those that have been victimized should not be silenced but should be embraced by the community." The identities of individuals receiving services from RAVE will remain confidential, only the location is being made public. RAVE. is dedicated to a supportive, empathetic and violence-free community. RAVE has provided free and confidential services to domestic and sexual violence victims as well as homeless women and children throughout Ionia and Montcalm counties for over 25 years. RAVE is dedicated to a supportive, empathetic and violence free community. To learn more or get help call and 24-hour crisis line at 800-720-SAFE.